For more than a quarter of a century now, blond Aryan axe-hero Axel Rudi Pell has steadfastly driven forward the legacy bequeathed him by Deep Purple and Dio era Rainbow. He's had his fair share of detractors of course, those who consider him at best "irrelevant" and at worst "a pale, third rate imitation", but throughout it all he's stuck to his guns and delivered on the money time and again. His secret has a lot to do with the fact that his band feels like just that (a band, not a bunch of mercenaries for hire), but if you're looking for this generation's answer to the God-like Richie Blackmore circa the late 1970s, you'll find none better. Beginning his 'solo' career in the late 1980s by calling time on Steeler – not the most creative of bands I'll grant you, although fourth and final album 'Undercover Animal' had its merits – 1989's debut 'Wild Obsession' immediately benchmarked the brand that has consistently delivered year after year ever since. To mark the 25th anniversary of the birth of his solo career, an extra special show was planned for those attending last year's annual 'Bang Your Head' festival in Balingen. The best part of a year in the planning, the mammoth three hour set would include a host of "legendary" guests – all of his former Steeler bandmates for starters, one time ARP band members Rob Rock, Jorg Michael and Jeff Scott Soto plus a host of big name stars such as Doogie White, John Lawton, Graham Bonnet, Ronnie Atkins, Vinnie Appice and Tony Carey (amongst others) – to make it a night that no one would ever forget! Not surprisingly, those who couldn't attend (most of us then!) are now being given the opportunity to share in the magic with the release of 'Magic Moments'. 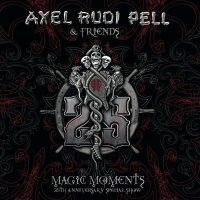 Billed as Axel Rudi Pell & Friends, this 3CD (or 3DVD/BluRay if you so prefer) box-set captures the energy and excitement of those both on and off stage, and as a consequence, is one of those "oh so rare" events that deserves to be treasured by all for eternity. Little merit in giving you a rambling blow by blow account of each song or solo – that scrumptious little joy is one for you to discover on your own – suffice to say the first disc kicks off with four tracks from Steeler and finishes with three from the early days, the second is a cornucopia of classic ARP from beginning to end, and the third ...well...that really pays tribute to the whole Deep Purple/Rainbow legacy that has been his touchstone from day one. How anyone could argue with a set-list featuring 'Mistreated', 'Black Night', 'Long Live Rock 'N' Roll' and 'Smoke On The Water' alongside originals like 'Eternal Prisoner', 'The Masquerade Ball', 'Long Way To Go', 'Mystica', 'Fool Fool' and 'Undercover Animal' amongst many other is completely and utterly beyond me! If you're in the least bit partisan to the cause, this release is absolutely essential!